Jeff Kanouse and Keith Loppnow present a check to Cori Denk of the Columbus School District for the Blessings in a Backpack program. 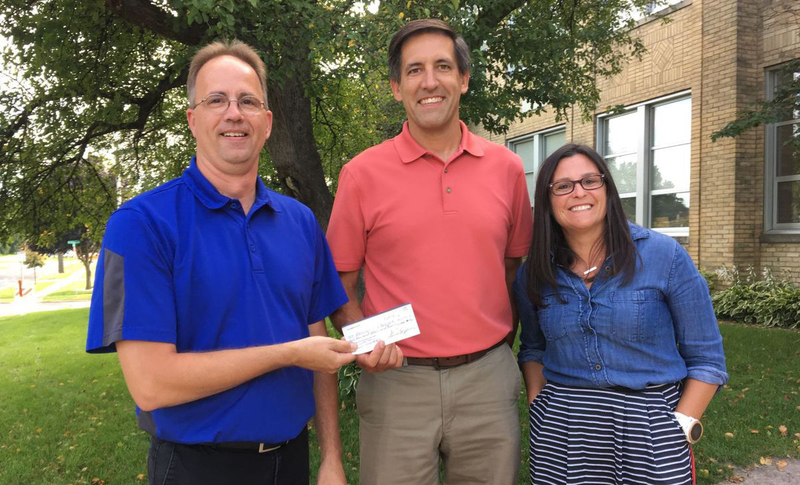 These grants were made possible by donations to the CAE general fund by local donors and Madison Community Foundation (MCF). CAE is an affiliated fund guided by a trust agreement with MCF. Since 2008 CAE has been a giving partner with MCF to enhance the cultural, educational, and economic vitality of the Columbus area, through charitable awards that sustain the quality of life of residents in Columbus, Fall River, and adjoining communities. For the past seven years, CAE grants have supported such projects as Boy Scout Troop 99, Columbus Area Senior Center, Columbus school music programs, Columbus Community Hospital health-promotion programs, Columbus Parks and Recreation facilities, Columbus Public Library programs, Olivet Church community programs, Redbud Players community theatre, Rotary Park facilities, and Savanna Oaks Cultural Center. Click here for previous grants [PDF].